The Lang Center is piloting a post baccalaureate program (currently called the Lang Social Impact Fellowship) that is intended to empower alumni scholars to “scale up” (replicate, extend, or deepen project impact) and sustain their impactful solutions by providing additional funding and support including mentoring, training, and advising during the fellowship year. Key features of the Lang Social Impact Fellowship program include: mentoring, training, and ongoing project support. Open to Swarthmore College alumni within 1 to 3 years of graduation. Previously launched a social impact project that is ready to scale. Demonstrated commitment to creating social impact. In-depth knowledge of and experience with the stakeholders and issue(s) in her/his/their area of focus. Feasible plan to take new approaches or solutions to social problem to scale (replicate, extend, deepen social impact) in one year. Track record of engaging (talking with, listening to) community groups or individuals beyond Swarthmore College. Persuasive plan to financially sustain the project beyond fellowship year. Evidence of outcomes achieved thus far, and plans for social impact measurement during the fellowship year. Commitment to work at least 20 hours per week on the project during the fellowship year. Note: Because of their directly relevant experiences, senior Lang Scholars would not only be eligible to apply but likely would be strong candidates for this fellowship. However, other Swarthmore College alumni who, like Lang Scholars, meet the criteria listed above are also eligible to apply. Raven Bennett ’17 graduated Phi Beta Kappa from Swarthmore College and received High Honors with a major in psychology and a minor in educational studies. During her time at Swarthmore, Raven engaged in social activism efforts to prevent sexual violence. She was an inaugural member of the Swarthmore College Title IX Student Advisory Team and Title IX Liaison Team. As a Lang Scholar, she created the Youth Activist Institute and the Fraternity Mentorship Program. Both initiatives were designed to prevent sexual violence by empowering participants to be activists. In her fellowship year, Raven will be replicating the Fraternity Mentorship Program, a sexual violence prevention program designed to capitalize on the strength of male peer relationships in fraternities in order to create positive culture change, at other US colleges and universities. Raven will also develop a business model to create sustainable infrastructure to support continued dissemination of the Fraternity Mentorship Program. Nimesh Ghimire ’15 graduated from Swarthmore College with a major in Economics. As a Periclean Scholar, Nimesh was deeply involved in experimenting with and learning from grassroots engagement and innovation models, having co-designed and implemented two Innovation Labs in rural Nepal – a space for community members collaboratively to design solutions to pressing local challenges – over the course of four years. Nimesh currently works as Renewal Manager for Ashoka’s Changemaker Campus program, where he works with 40+ colleges and universities in Ashoka’s network to help social innovation. For the fellowship year, Nimesh will focus on building the efforts at the Rural Innovation Lab and strengthening the Lab’s core program, while identifying steady revenue streams for sustainable grassroots innovation. A special major in Political Science & Educational Studies, A'Dorian Murray-Thomas '16 founded SHE Wins—a free social action and leadership development program for middle and high school girls in Newark who are affected by violence—while she was a Lang Scholar at Swarthmore College. A trauma-informed program, SHE Wins consists of a summer and afterschool Leadership Academy where girls hone their leadership, literacy, and self-regulatory skills through mentorship, project-based learning, and service-learning opportunities. A'Dorian's goal during the Fellowship year is to continue studying, developing, and scaling systematic and collective approaches to improving outcomes for urban youth. 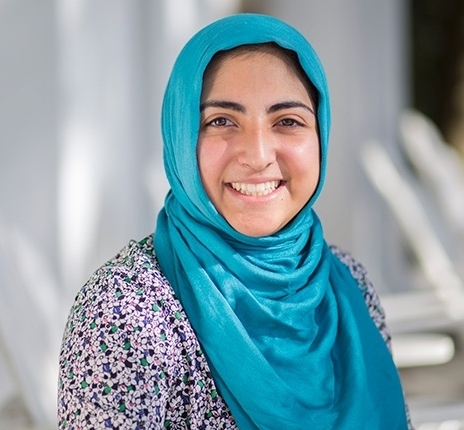 Fatima Boozarjomehri '18 graduated from Swarthmore College with majors in Peace and Conflict Studies and Islamic Studies. As a student at Swarthmore College, Fatima worked with the Afghan refugee population of Southern Tehran and designed projects dedicated to improving access to education and training for Afghan youth and women through two separate initiatives: The Fanoos Project (sponsored in part by the Project Pericles Fund of Swarthmore College) and ReVision (her Lang Scholar project). During the Fellowship year, Fatima will expand the scope of The Fanoos Project, a vocational training program for single mothers and focus on developing a sustainable business model. It is through the vision and generosity of Eugene M. Lang ’38 that communities facing significant challenges have come to know Swarthmore College students and alumni as social change makers. We are grateful for the opportunity to innovate and build upon the success of the Lang Opportunity Scholarship Program with this pilot program, the Lang Social Impact Fellowship.